It truly doesn’t take a whole lot of time or effort to make a dessert. A few minutes spent fiddling with a set of scales, then a batter comes together (mix wet with dry) and into the oven it goes. Meanwhile much more time than this is required trying to decide which album to play on Spotify. In the past month during which I didn’t manage to post a single item of baked deliciousness, I visited Seoul for the first time ever, met some lovely people, got back, changed the dessert menu at work, congratulated a friend on the birth of her son, bought a ticket to Tasmania, gave my notice at work and then got the wind knocked out of me when I heard that a friend had passed away. All this in one month. This is my dessert of the month. 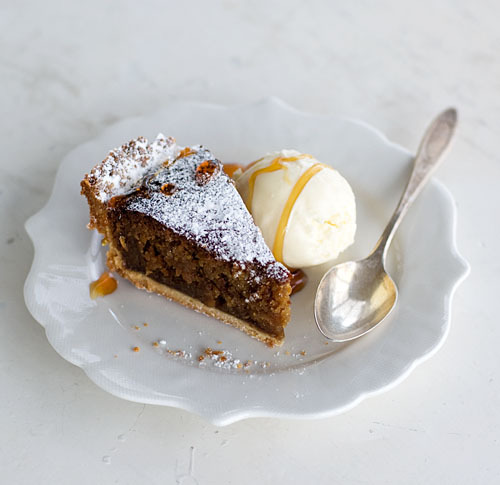 A slice of tart, sticky with golden syrup, oatmeal and almonds, served with a scoop of the easiest ice-cream you’ll ever churn at home. Life is a lot like dessert. Sweet, messy, pleasurable and often only half enjoyed in the moment with a mixture of guilt and regret. If you are baking phobic, start by making this ice-cream. 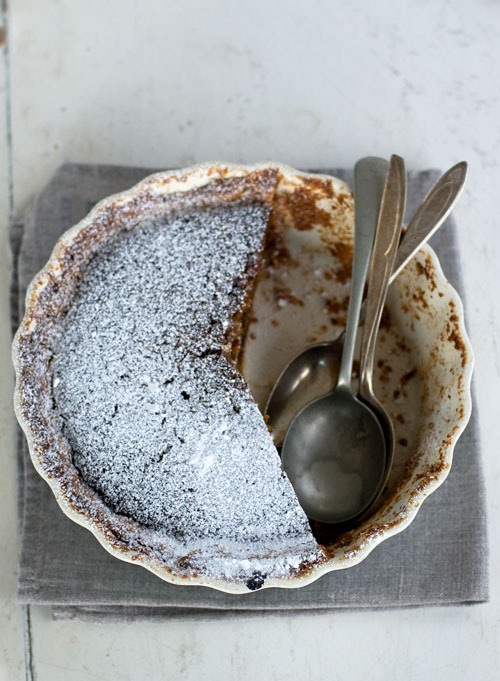 The splendid cakes and puddings that go so well with it will eventually follow. Combine all the ingredients in a bowl, stirring well to dissolve the sugar. Churn in your ice-cream machine according to the manufacturer’s instructions. Serve straight away or store well covered for a few hours in the freezer. We are kicking off the new year with a little road trip this morning. It’s only a couple of hours drive but I’m incredibly excited about leaving the city behind to spend a few days in a rented cabin. The first thing I plan to do when we get there is inhale deeply and hopefully not smell or hear civilization. 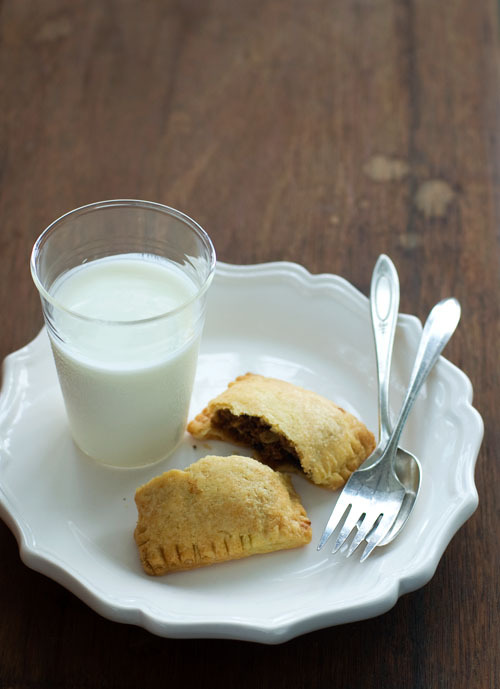 These pocket pies would have also made for the perfect car snack, if only there were any left. To make them, cut squares or circles of your favourite flaky pastry, stuff with cookie dough and bake for 20-25 minutes until golden brown on the outside. Serve warm, dusted with cinnamon sugar and you may never go back to making fruit-filled versions ever again. I enjoy government functions like I enjoy getting kicked in the nuggets with a steel toed boot. But this hotel always served bacon wrapped shrimp. That’s my number one favorite food wrapped around my number three favorite food. — Ron Swanson, Parks and Recreation. Two full days of gloom and rain has left me no choice but to give myself guilt-free permission to do nothing more strenuous than curl up on the couch for a whole afternoon, watching Parks and Recreation, and contemplating life’s big questions. Such as, can man live on cookies alone. And if so, why so many of us sing the praises of chubby, soft, chewy chocolate chip cookies when the wider family of chocolate cookies has much more to offer. I first encountered ultra thin chocolate cookies like these at Tartine Bakery in San Francisco. We’d bought a selection of baked treats, which due to a prior visit to Humphrey Slocombe on the opposite side of the street, meant I only got a chance to devour much later in our hotel room (after walking off the excesses of the day). A single bite of the ultra crisp, deeply chocolate cookie filled me with so much regret. Regret that I hadn’t bought more and that I wouldn’t have time to return to the bakery either. 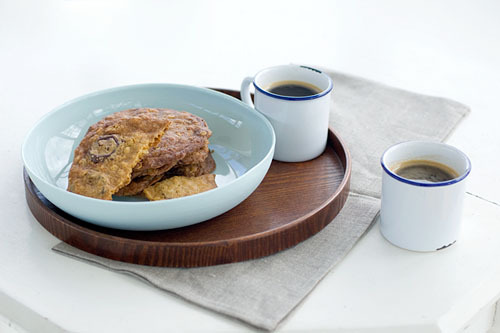 With great thanks to Alice Medrich however, I stumbled upon this recipe several months ago and am happy to report that the end result very closely resembles the magical cookie I first tasted. These crispy chocolate chunk cookies are my number one favourite food encased in my number one favourite texture. Worth every last shattered crumb and chocolate smear that may displease the couch you’re curled up on. Combine the flour and baking soda in a small bowl and mix together thoroughly with a whisk or fork. In a large bowl, whisk together the melted butter, oats, sugars, corn syrup, milk, and salt. Mix in the flour mixture. If the batter is warm from the butter, let it cool before adding the chocolate. Stir in the chocolate chunks. If possible, let the dough rest for at least several hours at room temperature or (better still) overnight in the fridge. 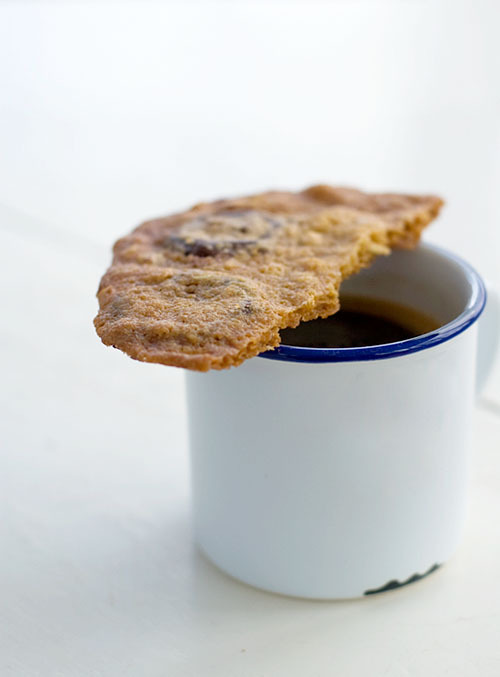 The rest makes for an especially crisp and extra-flavourful cookie! Preheat the oven to 325’F/160’C. Position racks in the upper and lower thirds of the oven. Divide the dough into 15 equal pieces. Lay out 3 sheets of aluminium foil, cut to fit your cookie sheets, on the counter. Arrange 5 pieces of dough well apart on each sheet of foil, remembering that the cookies will spread to 5 inches. Flatten each piece of dough until it is about 3 1/2 inches in diameter. Slide two of the sheets onto baking sheets. Bake for 20 to 25 minutes, until the cookies are thin and very brown. If they are too pale, they will not be crisp. Rotate the pans from top to bottom and front to back halfway through the baking time to ensure even baking. Slide the foil with cookies onto racks to cool completely before removing the cookies from the foil. Repeat with the third batch – you can even slide the next foil and cookie dough onto a hot baking sheet as long as you put the pan in the oven immediately. Cool the cookies completely before stacking or storing. May be kept in an airtight container for at least 3 days.